While wintertime has its own charm when the snow falls thick property owners are largely concerned about what effect the ice and cold will have on the outdoor features of their home. Not only does the accumulated snow affect the plantings, patios, decks etc. but sometimes, the thick layer of snow and ice can make it impossible to get out of or into your home or commercial establishment. The best way to deal with this situation is to hire a company like ours for seasonal snow removal services. We at AK Lawn Care are a front-running snow removal contractor based in Milan, MI and cater to customers in and around Ann Arbor, Belleville, Chelsea and Canton. We also cater to customers across Chelsea, Dexter, Dundee and Plymouth. Over the years, we have also created a very strong customer base across Saline, Tecumseh, Ypsilanti and the surrounding areas. 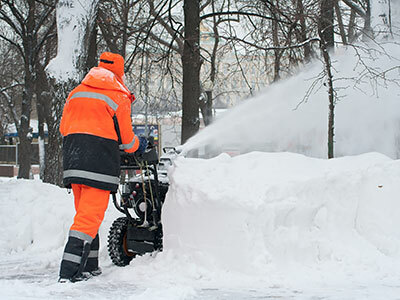 We understand the inconvenience a heavy snowstorm can cause and the ice and snow that gets accumulated can become very difficult for property owners to clear up themselves. This is why we offer excellent snow management services and can design customized plans for you based on the size of your property and requirements. While we do use mechanical equipment like snow plowers and snow blowers, we also know that there are certain areas of a landscape that these large machines cannot access. In these situations, our snow removal experts use large, commercial-grade rubber-coated shovels to remove the snow from your deck, patio and other smaller or odd-shaped areas of your property. Our personnel work tirelessly and efficiently to ensure that all the outdoor spaces of your property are free of snow and ice. When there is a severe snowstorm, we also use giant snow blowing machines. These are generally affixed to tracked vehicles or trucks. These machines are used to clear areas with deep drifts and snow, in which regular trucks would simply become stuck. These machines don’t just push all the snow to the sides of the roads; they blow the snow very far away from the edges of the roads, driveways, and pathways which means the shoulder areas of the roads are kept clear. We use loaders in our work. These pieces of equipment can move large amounts of ice and snow. They have larger windows as well as higher vantage points. The wheel loaders we use can be affixed with a range of equipment such as snow blowers, buckets, pushes, as well as snow plows. Salt spreaders are an important component of any snow removal job and we use them in our residential, commercial and industrial snow removal projects. The salt spreaders are attached to the rear of our trucks. Tailgate spreaders are used for residential communities, parking lots and driveways, while the larger salt spreader hoppers are used in commercial and industrial applications. At AK Lawn Care, we handle every aspect of your job from start to finish. Call us at 734-439-3063 and speak with our experts about your requirement. You can also send us the specifics of your project via the Contact Us form on this page and we will revert shortly.